Elizabeth was given the name of the Holy Trinity for her consecrated life in the Carmel of Dijon. In here writings, however, she referred to herself as "the Praise of Glory" (Ephesians 1:12) on account of her special gift of penetrating the sublime truths in the epistles of St. Paul. So abundantly fruitful was the life of God in here that she seemed to reflect in here every act the eternal processions of His Truth and Love. Saint Elizabeth has been called "another Thérèse". fromThe Very Rev. Father General, O.D.C. Sister Elizabeth of the Trinity, venerated daughter of your Carmel, is one of the most privileged members of our order raised up by God in this century. Suffice it to say that many of our religious are proud of the fact that they owe their vocations and deeper understanding of the life of Carmel to the providential influence of this humble Carmelite of Dijon. It is an undeniable fact that Sister Elizabeth had a profound understanding of and lived to the full the spiritual ideal of our order. In fact, it would be difficult to study her typically contemporary spirituality other than in the light of her characteristically Carmelite ideal. Her doctrine and her spiritual life were nourished by the pure doctrine of Carmel. Her spiritual attitude is one of openness to God in her search for Him. The dominant disposition of her interior life is this quest for her Spouse dwelling within her own soul. This manner of seeking God, this receptive orientation towards Him and Him alone, constitutes the essential attitude of our Carmelite spirituality. Sister Elizabeth’s desire to live in a state of continual prayer explains her unflinching fidelity in corresponding with the least movement of the Holy Ghost. Hers was a prayer of faith (so typically Carmelite) founded on sacred scripture and above all, on the writings of her “dear Saint Paul”, wherein she discovered the priceless treasures of God’s intimate life and lost herself in “hallowed darkness”. Her desire to penetrate ever more deeply God’s mysteries meant acute suffering, long and painful purification, and passing through the dark night of faith, in order to arrive at immersing herself completely in intimate union with her beloved “Three”. 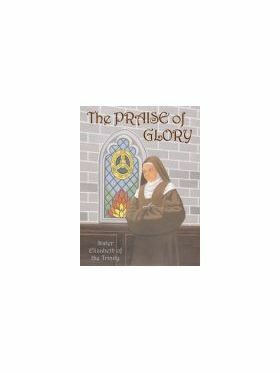 The spirituality of Sister Elizabeth is characterized by her success in making her whole spiritual life converge toward her unique ideal, namely, the “Praise of Glory”. We can truly say that this was her specific and precise vocation, in the same way that we affirm that the glory of God is the noble ambition and basic preoccupation of Carmelite spirituality. 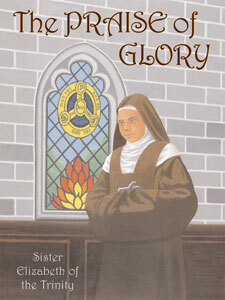 Sister Elizabeth of the Trinity received a vital and efficacious grace to dedicate her whole life to the glory of God, not by the splendor of external deeds and achievements, but by leading souls to seek God within themselves and teaching them to abandon themselves to the intimate working of His grace within their own hearts. She herself has described her exalted mission: “To lead souls to recollection, to help them to go out of themselves in order to adhere to God by a very simple, wholly loving movement; to keep them in this great inner silence, which allows God to imprint Himself on them and to transform them into Himself.” It is not difficult to see how this ideal of hers to lead souls to deep interior recollection, so that by adhering to God in complete abandonment, they may become the praise of glory of His goodness, is in complete harmony with the apostolic zeal of our holy Father Saint Elias and our holy Mother Saint Teresa. The Carmelite ideal as lived by Sister Elizabeth of the Trinity would not be complete if we omitted referring to her loving contemplation of our Blessed Lady and her intimate union with the Immaculate Mother of God. Herein we have one of the most characteristic features of her spirituality. The humble Carmelite of Dijon continually admired in our Blessed Lady the purest and most attractive example for all who, amidst joys and sorrows, abandon themselves with complete confidence in our Lord and never allow themselves to lose sight of Him, but by continual loving contemplation adhere to His every gift. May this daughter of our revered Dijon Carmel draw down God’s blessings on her own community and on our entire Teresian family, so that we may all live ever more perfectly our Carmelite ideal, by our loving intimacy with the Master in prayer and by our silence, so that He may be glorified in us! Finally, we hope and pray that very soon we, the brothers and sisters of Sister Elizabeth of the Trinity, may be able to look on her as a model, officially proposed to us by Holy Church for our imitation. Apostolic zeal — Correspondence with grace — Sorrow for sin — A general confession — Fervent gratitude — The end of the mission. “We are to have a grand mission during Lent, and I am already praying for its success. How I long to bring souls back to my Jesus! I would give my life to help ransom one of those He so dearly loves! I long to make Him known and loved throughout the whole world! I am so delighted to belong to Him, and I wish that all men would place themselves under His easy yoke, and bear His light burden. How I long to bring back Monsieur N— to Jesus! He is an excellent man, as charitable as it is possible to be, but he is estranged from God. I have offered several communions for this intention, and I depend upon the mission’s carrying out this splendid work. It would be too great a boon for me to have some small part in it. What would I not do to help it! Elizabeth was engrossed by her longing for the salvation of souls, for which her heart, inflamed with divine love, offered fervent prayers. “Sunday, March 5—I offer Thee, O my God, the sacrifice of my life for the success of this mission; let me suffer, only hear my prayer! Look upon my tears and sighs, and have mercy, Almighty God, in the Name of Jesus, my beloved Spouse! “Art Thou not, O Father, moved to pity? What more dost Thou require? I must win souls, O my God, let them cost me what they may! My whole life shall be their expiation, and I stand ready for any suffering if Thou wilt but have mercy on the world, in the Name of Jesus, my Divine Bridegroom, Whom I long to console! “Monsieur N— came to the mission, and I thanked God fervently. “Sunday, March 12—There was a very fine sermon at Vespers. I think I liked it best of all. When I heard of the fervent zeal we ought to have, my eyes filled with tears. O good Jesus! Though I have so long been careless about the salvation of others, and have myself offended Thee, now, at least, I long to bring back souls to Thee; my heart burns for this work of redemption. I crave to console Thee, my Divine Spouse, to make Thee forget the pain that sinners cause Thee! Christ wrought His work of Redemption by suffering, and He calls us to follow Him on the path of sacrifice, the certain means of saving souls. “O Jesus! behold I implore Thee to send me suffering! There is nothing that I would not welcome, only give me souls! Give me the special soul for which I pray. I hoped that all I wished for would be realized when I saw that sinful man at the mission, and now he comes no more! . . .
“Tuesday, March 14—We had a splendid sermon on eternity. The Redemptorists speak of God with such wonderful love. How I love them for preaching such a gospel! Ah! They have been able to follow their vocation, and they are happy, for they bring back many souls to God. Let them rejoice in such blessedness! When, O Jesus! shall I follow my call, and give myself to Thee? I thirst for sacrifices and bless all I meet with in my daily life. My ardor has redoubled during this mission, and my heart burns to convert souls; the desire pursues me even in my sleep, and leaves me no moment of repose. My God, look Thou upon the vehement longing of my heart, and send me sufferings, which alone can make my life endurable! O heavenly Father, let me suffer or die! On Holy Saturday Elizabeth gave full vent to her sorrow: “Poor Jesus! What a thorn to pierce Thy heart! She whom Thou lovest suffers with Thee, for there is no sacrifice I have refused for this conversion—is there, Jesus? Elizabeth ends her notes on the sermon on sin with these words: “After a very stirring sermon on sin, the preacher pronounced an act of contrition aloud, which made me cry bitterly. Two days later she was “deeply moved and disturbed” by an instruction on confession. “For some time I have been thinking about contrition. I feel that I would rather die than offend Thee wilfully, even by venial sin. But in the past, when I was 10, 11, 12, or 13 years old, had I the same regret? Did I even think of it? I tremble as I remember the time. I have decided to make a general confession. Yet I am frightened at it. How can I remember the number and the different kinds of sins? But God will help me. He will show me my sins in all their malice and their horror. “Wednesday morning, March 1—I have been to confession. I met with an exceptionally good confessor, for which I thank the good God. The father found that I had the signs of a genuine vocation; he also believes that Jesus calls me to Carmel, and says that this is the most beautiful of vocations. I made a general confession, reckoning from my first Communion. He assured me that I had not lost my baptismal innocence.” Elizabeth makes no comment upon this assurance which we know was a great joy to her, but her thanksgivings are many. She never tires of praising Him Who has done great things in her and Who keeps fresh favours in reserve. She was moved to heartfelt gratitude by the discourse upon the world. “I thank Thee, my God,” she exclaims, “for having shown me the vanity of this world from my earliest days: I thank Thee for having drawn me to Thee! “I intend asking the advice of Pére L— on this subject. . . . I have several other things to say to him, and long to see him. “What a pity! the mission is nearly over. How quickly it has passed! I feel sad, but Jesus bids me be full of joy at the thought of soon being all His own. I look at the world and all to do with it as a passing show, and do not let my heart go out to it. Every morning, when I forecast the coming day, I promise certain sacrifices to my Divine Bridegroom. When there is one that costs me dear, and I hesitate, Jesus insists so strongly that it is impossible to refuse it. Easter Day—Easter joy does not cause Elizabeth to forget her sorrow for him for whom she has prayed so fervently. “Alleluia! Alleluia! Good Jesus, I am weeping on this day of glory and joy. I weep because the mission is over, and, above all, because of the obstinacy of Monsieur N—. I heard Thy voice in the depths of my heart this morning bidding me not despair, for if my prayers seemed unheard, at least all my petitions and sufferings had consoled Thy heart. The thought comforts me; yet can I be happy while Thou, my Spouse, art suffering? But rejoice, O Lord, over all the conversions won during this mission, and I will unite myself to the joy of Thy heart that I may spend this Easter Day less sadly. On this beautiful feast think solely of the lost sheep that have returned to the fold. The burning zeal which so consumed her in her early youth was rooted in a charity “set in order” by the Divine Spouse Who had “brought her into the cellar” of prayer.